New York is one of the top romantic destinations in the world. From ice skating at the Rockefeller Center in the winter to drinks with a view of the Statue of Liberty, there is something for everyone. Our list of the top romantic hotels in New York includes rooms with modern design as well as classical decor. You will find luxury, mid-range and affordable options. This stylish hotel in the heart of Times Square offers modern guest rooms with minimalist decor, a slick work desk and a 32-inch flat screen TV. Ask for the Deluxe City View room if you want a view of the city skyline. 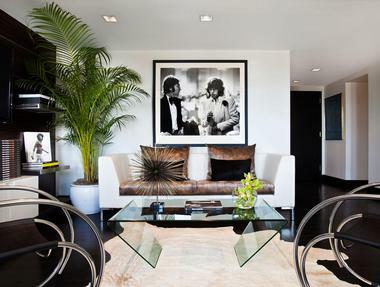 The penthouse suites are spectacular, featuring a separate living area, wet bar and kitchenette. Ask about the Paparazzi Project package which costs $2,520 and includes a night in a 1,000-square-foot penthouse, hair & makeup, and a photography session designed to make you feel like a celebrity. If you are looking for unique romantic hotels in NYC, rooms start at $449 per night. If you want to be close to the High Line Park in Chelsea, check into the romantic High Line Hotel, designed to feel like an elegant guest house from a bygone era. Enjoy perfectly brewed coffee throughout the day, relax in the gated courtyard inspired by Paris, and dine at Garden Restaurant which serves light meals and a diverse selection of drinks. This romantic hotel in NYC has 60 guest rooms, including the High Line Suite which offers 500 square feet of plush living space, decorative fireplace and a 46-inch HD TV with premium cable. Room start at $499 per night. 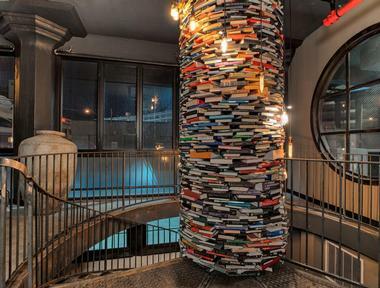 Located in Long Island City, Queens, the Paper Factory Hotel is a chic hideaway located in a former paper factory. For a couple that feels like they've seen everything that New York has to offer, this will be a refreshing surprise. The hotel has 122 trendy guest rooms and suites with spacious layouts and large windows which let in plenty of natural light. Unique features include a spiral staircase supported by a giant stack of books and a kitchen where you can prepare your own meals. 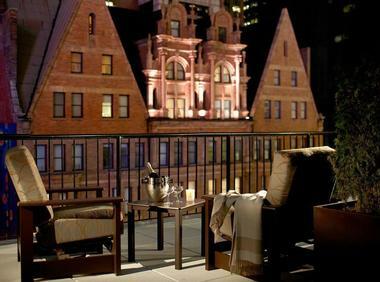 The Hotel Giraffe is a romantic getaway idea for couples, located on Park Avenue South. 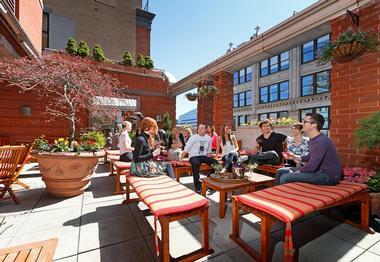 Hotel guests receive access to the private roof-top garden, complimentary passes to NY Sports Club and WiFi throughout the hotel. In the lobby, complimentary European-style continental breakfast is served in the morning and snacks are available through out the day. On weekdays, champagne, wine and cheese are offered, accompanied by live cocktail piano music. There are 73 guestrooms, including 21 suites. Rooms are offered in two categories, superior and deluxe. Book one of the Deluxe rooms on your romantic getaway, which feature French Doors that open onto private balconies which are adorned with fresh flowers. There are only seven guest rooms on each floor, with 10 foot ceilings, black and white original photographs on the walls, and satin bedcovers. Guest can dine at Barna Restaurant which serves a variety of different foods including Tapas. The Union Square Farmers Market is within walking distance. Take the subway a few stops uptown to reach famous NYC attractions such as the Empire State Building, the Rockefeller Center and Times Square. The Hotel Giraffe's central location on Park Avenue South and 26th Street in Manhattan is approximately a 45-minute cab ride from any of the three New York area airports, depending on traffic. Rates start at $295. The SoHo Grand Hotel is located in the heart of SoHo between Grand and Canal Streets in Manhattan. If you are planning on visiting art galleries, boutiques and restaurants in Downtown Manhattan on your weekend getaway, the property provides an ideal location. Nearby attractions include Chinatown, Wall Street, Tribeca and Greenwich Village. Dine at unique restaurants and go shopping. The property has 367 custom guest rooms on 17 floors. Guest amenities include Frette bed linens, Egyptian cotton towels, toiletries by Kiehl's, 2-line telephones with dataport and voicemail, 24-hour complimentary freshly brewed coffee and 24-hour room service. The Gallery serves Global Comfort Cuisine in an intimate setting, while the Grand Bar and Lounge offers light meals and cocktails. Room rates start at $259 per night. The Quin Hotel on 57th Street, near Carnegie Hall and Central Park, is located in a 18-story pre-war building which previously housed the Buckingham Hotel. You will be close to the Fifth Avenue shopping, Times Square, Lincoln Center, Rockefeller Center and other famous attractions. One of the unique features are the "Quintessential Assistants" which will answer guests' wishes. Work out at the state-of-the-art fitness center, get massages at the Fresh spa, and get massages at the signature haute-American Restaurant. The permanent Art Gallery features the works of acclaimed Irish painter Patrick Graham to honor the hotel's artistic heritage (several famous composers, opera stars and actors, including pianist and composer Ignacy Jan Paderewski lived in the Buckingham Hotel). Rates start at $490 per night. The Hotel Elysee is a romantic hotel on 54th Street between Madison Avenue and Park Avenue. You'll be close to famous attractions such as the Rockefeller Center, Times Square, famous shops and restaurants in the area. There are 86 deluxe rooms, 3 junior suites, 11 suites and 1 royal suite. Rooms feature complimentary high-speed internet access, a writing desk, two-line phones, digital alarm clocks, voice mail, cable TV and VCR, cotton robes and a variety of Gilchrist and Soames bath amenities in the marble bathrooms. Guests can dine on classic American cuisine at the Monkey Bar & Grill. In existence for over sixty years, the Monkey Bar & Grill has hosted Joe DiMaggio, Tennessee Williams, Marlon Brando and Ava Gardner. Central Park is several blocks away, Rockefeller Center is a five-minute walk, and the Museum of Modern Art, St. Patrick's Cathedral, Times Square, and Broadway are all close by. Rates start at $295 . If you are looking for honeymoon ideas in the city, Tribeca Grand is a great option. Located in the chic TriBeCa neighborhood in Manhattan, you will be close to fashionable shops, restaurants and independent film companies. The romantic hotel offers 24-hour concierge and room service, internet access, Herman Miller executive chairs, Egyptian-cotton Frette bathrobes, and toiletries by We Live Like This. There is a 98-seat screening room for 35 mm-film and video projection, complete with in-theater dining and an adjoining reception area. Choose from 203 guest rooms, including six suites and Grand Suite with a private rooftop terrace. The Church Lounge serves food an drinks, and now offers a 30-seat outdoor cafe along 6th Avenue. Rooms start at $400 per night. 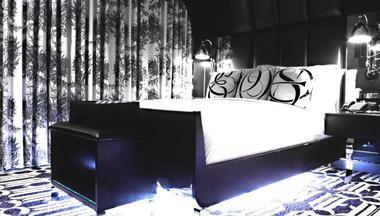 Night New York is a chic midtown Manhattan boutique hotel decorated in urban Gothic style. The hotel is located near Times Square. Each guest room features a 37-inch wall mounted Panasonic Plasma TV, 400 thread count Frette linens, feather duvet, Telegraph hill bathrobes and Bose CD Wave System with Ipod connectivity. 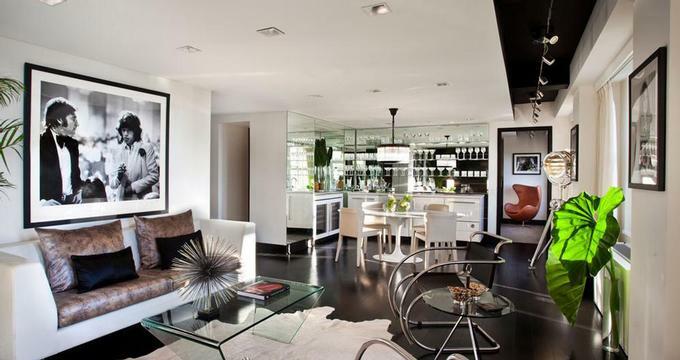 The most luxurious guest accommodation is a beautiful triplex penthouse suite. Nightlife Restaurant and Bar is one of the best restaurants in the area, serving light fare along with exotic cocktails, designer tequilas and Cherry Truffle Martinis. Red Moon is an intimate lounge and restaurant that serves a fusion of Japanese and Vietnamese cuisine, along with sake and hand-crafted specialty cocktails. Rooms start at $309 per night. When you stay at The Iroquois in Midtown Manhattan, you will be close to the city's landmarks and attractions while enjoying luxury service and elegantly decorated guest rooms. Before dinner, enjoy a delicious cocktail at Lantern's Keep, a sophisticated lounge reminiscent of a 1920's Parisian salon. 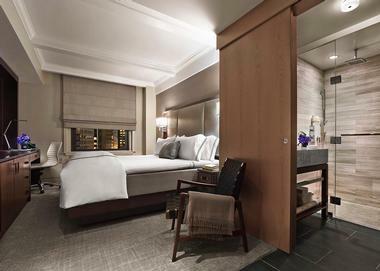 The romantic NY hotel has 114 guest rooms and suites with Italian marble bathrooms and Molton Brown bath products. Plush Frette linens are a nice touch on a romantic vacation. For the ultimate in luxury, ask for one of the remodeled nine suites which have Jacuzzi tubs, Bose radios with iPod docks, two HD TVs, views of 44th Street and separate living rooms. The hotel has a Les Clefs d'Or certified concierge who can help you plan your romantic activities in the city. When you can't get a ticket for a sold-out concert or your favorite sports game, ask the concierge. Triomphe is considered one of the best restaurants in Midtown Manhattan serving a seasonally inspired menu of innovative French dishes. Rooms are priced from $280 per night . An important part of the travel experience is choosing the best place to stay where you can return and relax after a day of exploring the busy city or exhausting business meetings. Dream New York is a great choice because of its central location, cozy lounges, gourmet food and modern guest accommodations. The hotel is located in a historic Beaux-Arts building and features unique design touches such as a two-story aquarium and an art gallery with portraits hanging only on the ceiling. Located at between Broadway and 7th Avenue on the 55th Street, the hotel is close to Central Park, Lincoln Center and Times Square. You'll be surrounded by a variety of restaurants and tourist attractions, and have easy access to the subway for exploring other parts of the town. There are 216 guestrooms and suites with large flat screen TVs, Hydro Basic bath products, and 300-thread-count Egyptian cotton sheets. There are 14 floors at the hotel - ask for a room on one of the highest floors for best views. Serafina restaurant serves Italian food while AVA Lounge offers panoramic views of the city skyline from its rooftop location. 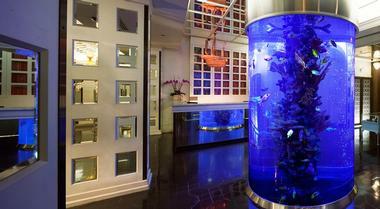 Another popular meeting spot is Rm.Fifty5, the chic lobby bar where you can watch colorful fish swim in the giant aquarium. Rooms start at $190. 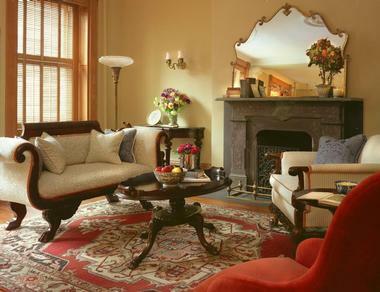 The Inn at Irving Place is a boutique getaway in Gramercy Park, offering twelve guest rooms, junior suites and residences. Guests are accommodated in two restored townhouses which feel more like a personal residence than a hotel. Luxury services at this romantic hotel include daily personalized maid service, nightly turndown service, Valet service, Concierge to help you plan your visit, 24 hour limited room service, European-style continental breakfast and complimentary wireless internet. Rooms feature Frette bed and bath linens, Penhaligon's fine bathroom amenities, and Sony CD/Radio/Alarm or iPod docking stations. Travelers can choose from several dining options, including Lady Mendl's, Cibar Lounge and Pure Food & Wine, an upscale organic raw cuisine & juice bar from Jeffrey Chodorow. You will be within walking distance of Gramercy Park, Union Square Park, Theodore Roosevelt's Birth Place, Greenwich Village, SoHo, NoHo and the Flatiron District. Residences start at $325 per night. 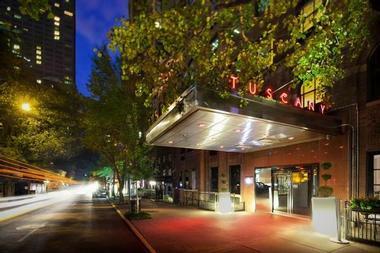 St Giles Hotel New York - The Tuscany is located at 39th Street between Lexington and Park Avenues. This modern boutique getaway offers 106 rooms and 16 suites which measure at least 480 square feet in size. The hotel offers a full-service Concierge who can help you get tickets to a show in Times Square, restaurant reservations, and fulfill other requests. Sweat, the 430-square-foot fitness studio, has cardiovascular machines and free weights. Sweat is located on the second floor. The hotel's Audrey Lounge & Café serves contemporary cuisine in a casual yet sophisticated atmosphere. Rooms offer luxurious amenities, including Aveda bath products, 250 thread count sheets, and goose down comforter and pillows. For business travelers, hotel rooms offer High Speed Internet Access, an oversized work desk, and two telephones. Room rate for a double starts from about USD $299 per night. 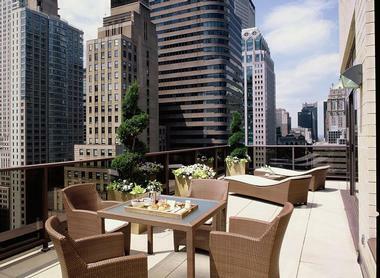 The Sherry Netherland is a luxury getaway located right next to the famous Central Park. The hotel is conveniently located on Fifth Avenue, just steps from the park and many Midtown attractions. The property has 50 individually furnished rooms and suites. During your trip, work out at the hotel's state-of-the-art fitness center and dine at a selection of gourmet restaurants in the area. Rates start at $439 per night. Conveniently located near the Madison Square Garden, Empire State Building and other mid-town Manhattan attractions, the new Hyatt Place New York/Midtown-South offers travelers a grea location and luxurious amenities. Perfect for the "city that never sleeps," the hotel has a Guest Kitchen which serves made-to-order snacks, sandwiches and entrees 24 hours a day. Breakfast is delicious. 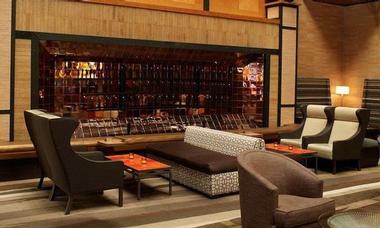 WThe modern hotel features plush Hyatt Grand Beds and state-of-the-art media and work center. The 42-inch flat-panel high-definition television easily integrates with laptops and other electronic devices. There is a Cozy Corner sofa for reading and bathrooms with granite countertops. Guests receive complimentary hotel-wide Wi-Fi and continental breakfast buffet. Room rates at start at $280 per night. The hotel's central location makes it easy to go see a Broadway play and explore nearby museums, including the Met.Famous Fifth Avenue shops are just steps away. Guest rooms and suites at Cassa Hotel are furnished with Frette linens, robes and towels. There is a 42-inch lat-screen HD televisions and Wi-Fi Internet access throughout the hotel. The 24-hour cardio center makes it easy to do a quick workout, although sightseeing and shopping can give you enough exercise. Dine at BLT American Brasserie serves delicious dishes, including sumptuous desserts. 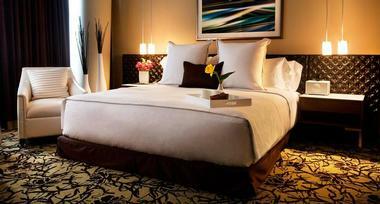 Wyndham Midtown 45 at New York City NYC is a Midtown hotel with 203 guest rooms, suites and apartments. Accommodations feature custom furnishings, limestone baths and fully equipped kitchens. Rooms and suites are furnished with high end amenities, including LCD TVs, WiFi, Frette linens and designed bath amenities. Nightly rates at start at $470. Located at Lexington Avenue and 39th Street, St Giles Hotel New York - The Court is a modern getaway with a residential feel. 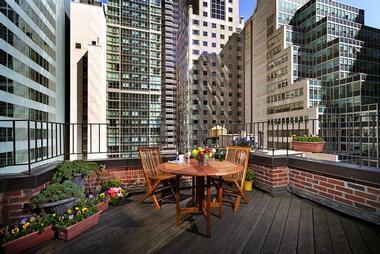 Nearby attractions include Madison Square Garden and the Empire State Building. The hotel is located three blocks from the Grand Central Station. The hotel features a nightlife hot-spot the Wetbar and Drew Nieporent's Icon restaurant serving contemporary American cuisine with Mediterranean and Asian influences. The restaurant has a private dining room and an outdoor courtyard. There are 198 guest rooms, including 40 suites. Guest rooms have oversized work desks, internet access, Aveda bath products, and luxurious terry and cotton W robes. Room rates for doubles start from $289. Located in a stylish Art Deco building in New York City, the Chatwal is a luxury hotel with design and service inspired by the golden age of travel. 24-hour butlers stand by to attend to your every need at this midtown Manhattan hotel. There is 24-hour room service and 24-hour fitness center with an indoor saltwater pool. The hotel has 50 guest rooms and 26 luxury suites designed by Master Architect and Designer Thierry Despont. 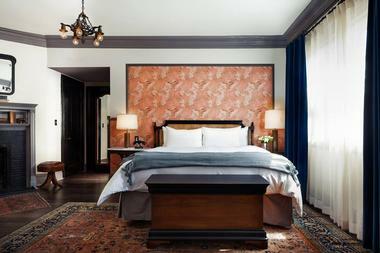 Guest rooms measure at least 300 square feet in size with plush finishes. Enjoy the private bar where you can mix your own cocktails.Luxury amenities include handmade mattresses, Frette linen and custom robes. One Bedroom Suites measure 850 square feet in size and have two full bathrooms. 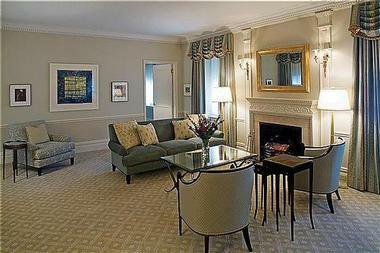 Each luxury suite has an entryway foyer which leads to a spacious separate sitting room and master bedroom. French Doors lead to a spacious outdoor terrace. The Lambs Club serves Modern American cuisine in a luxe Empire Deco setting. The restaurant is named after America's first professional theater club, The Lambs, where the club used to meet, including famous actors like Charlie Chaplin. The spa offers three spa rooms, three private changing suites with steam showers, and a manicure and pedicure studio. Facilities include a Jacuzzi spa, a saltwater lap pool, a relaxation lounge and a fitness center. Room rates start at $565 USD. 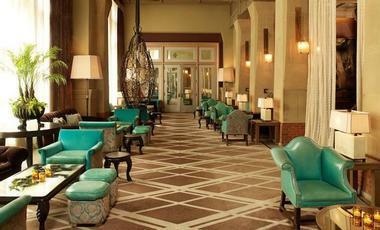 This is a Starwood Luxury Collection hotel which means that you can use Starpoints to book your stay.